Discover MONOI DE TAHITI®, the legendary ancestral Beauty Secret of the beautiful island dwellers of French Polynesia. Deep in the South Pacific on the fabled islands of Tahiti, for centuries the beautiful Tahitian women called “Vahines” have used MONOI DE TAHITI®. Famous for their youthful skin and lustrous hair they used MONOI DE TAHITI® daily to hydrate, protect their skin and to condition their hair. A few drops in a hot steamy bath will help you relax and keep your skin soft and subtly fragrant. After a shower or a bath Monoi de Tahiti softens and helps re-hydrate the skin to its natural, healthy look. As a pre-shampoo hot treatment it helps repair and deep-condition the hair to a healthy shine. After a swim it helps protect the skin against the combined negative effects of the sun, the wind and salted sea water. MONOI (pronounced Mah-noy) is an ancient Tahitian word meaning “scented oil” in the reo-maohi language. This natural skin care product is made from Tiare Gardenia blossoms and coconut extract from the Cocos Nuncifera variety. The combination of these locally grown flora act as a natural barrier against dehydration that can cause wrinkles and protects the skin against sun and wind damage. Extensive tests and analysis over the last few years are validating the long standing traditional claims of MONOI DE TAHITI®. It’s skin hydrating qualities are shown to be superior to those of other natural vegetal oils. Only the result, of tiare soaking in coconut oil, can be called MONOI. MONOI DE TAHITI® is a naturally concentrated emollient which penetrates easily into the skin. Helping to re-hydrate the layers of the epidermus and to shield the skin against external damages. Lab tests demonstrate, after the very first use, MONOI DE TAHITI® helps the skin to look better and healthier. MONOI, a Polynesian ancient traditional product brings it’s unique and exotic properties to modern cosmetology. treat yourself to MONOI DE TAHITI®. It is the perfect Polynesian antidote to dry skin! MONOI DE TAHITI® solidifies naturally below 72° F.
Tahiti’s national flower native to the Pacific Regions blossoms all year long. It’s exotic yet delicate fragrance fills the air all throughout French Polynesia. The small 3-foot tall bushes grow best on soils of coral origin. 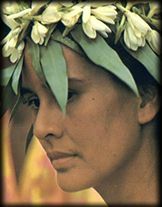 The Tiare flowers are deeply rooted in the cultural life of the Polynesians. The tourists receive a lei created with them on their arrival, and the Vahines use them to enhance their beauty everyday. Polynesian’s also use them as a natural air freshener by simply placing the closed blossoms in a dish of water and then making lei’s out of them as the buds open. 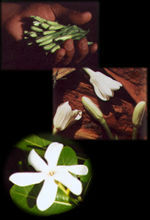 Of all the Tahitian flowers the one used most for traditional medicine is the Tiare. Yet the moisturizing and firm forming virtues that come from using Tiare flowers in the making of MONOI are it’s most remarkable and famous application. The natural moisturizing virtues of MONOI come from copra oil. The coconut tree (cocos nucifera), in Tahitian called “haari”, comes from the Palm tree Family and is ranked first in Polynesian Flora. The coconuts are harvested from the many plantations. The pulp once taken out of the shell is dried under the sun. Once dried and taken to the refinery the oil is extracted through a pressing process. Authentic MONOI DE TAHITI® is easily recognized by it’s Appellation D’ Origine logo. This ensures both high manufacturing standards and protects the consumer against widespread counterfeits and imitations. Indigenous to Tahiti and found nowhere else in the world – the Gardenia Taitensis blossom, one of the unique components of authentic MONOI DE TAHITI® is renowned for it’s exotic potent fragrance and it’s special moisturizing properties. The unique local know-how and the characteristics of the special qualities of Polynesian soil have made this prestigious award of A.O. a first for cosmetic properties of France.